It was a long week for Northwestern, as the team prepared to get out of an early-season hole. But thanks to a robust effort, especially by senior Lok Sze Leung and her clinching point against Purdue, the Wildcats swept their weekend matches to move above .500 for the season. Northwestern did not have it easy in its Big Ten opening weekend, eventually beating both of its opponents, but only barely in the latter match. The Wildcats began Big Ten play Saturday against Penn State and then squared off Sunday against Purdue. Northwestern is only allowed to count 11 of its 13 games against Big Ten foes toward its conference record, and elected not to count the Purdue matchup. The turmoil started before this weekend when the No. 23 Wildcats’ (3-2, 1-0 Big Ten) head coach Claire Pollard took an indefinite “leave of absence” for family reasons last week, the players could not wear any NU apparel in practice in the lead up to the pair of contests, and two of the nine members of the team were injured. More was yet to come as the weekend began. Against the Nittany Lions (1-5, 0-1), a team the Cats have never lost to, sophomore Manon Peri hurt her knee during her singles match on the No. 3 court. After a medical timeout, Peri continued to play, but before the first set ended, she conceded defeat with a medical forfeit. On Sunday, Peri had an MRI, but the results have not been disclosed. Beyond Peri, sophomore Maddie Lipp is out for the season and freshman Rheeya Doshi is suffering from shin splints but is expected to return after next weekend. Before the weekend, the players were disallowed by coaches from wearing NU clothing — going so far as to be without a locker room until Friday and wearing practice shirts inside out. But with a strong 4-3 victory Saturday, the Cats proved they have earned the NU program name once again. For the freshmen, getting the first Big Ten matchup under their belts meant a performance in front of a large audience. Energy so far has been the key to helping the freshmen adjust to the college pace of the game, and the crowd on hand Saturday brought plenty of it. Against the No. 33 Boilermakers (2-2, 0-1), adversity showed up yet again. Due to Peri’s injury, the Cats were down to six of the nine players on the roster. Without any 2015 doubles experience, sophomore Jillian Rooney stepped up to replace Peri at the No. 2 doubles court with freshman Erin Larner. Larner and Rooney gelled nicely to take the victory. 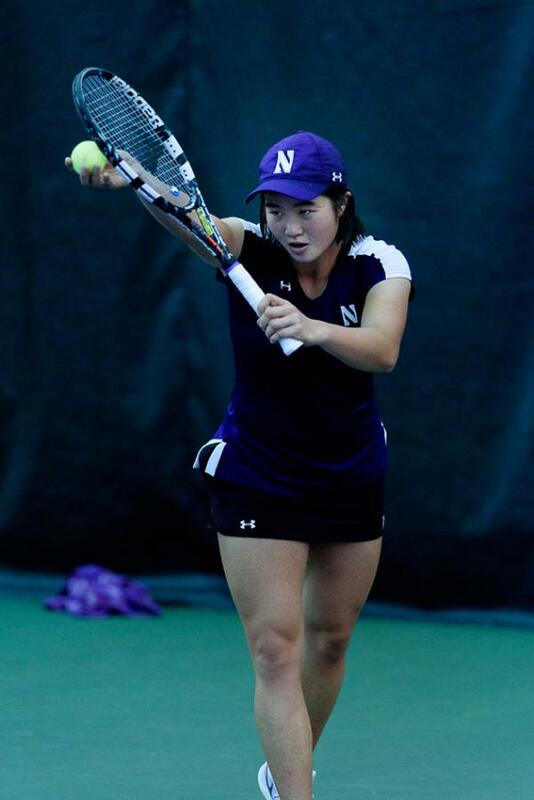 After the tightly contested doubles point and down-to-the-wire singles play, NU took the overall victory 4-3. Leung clinched the victory for the Cats in the tiebreak game of the second set. The senior began the year at the No. 3 singles spot, moved down to No. 4 but then returned to No. 3 after Peri suffered the injury on Saturday. Throughout the weekend, NU showed a competitive fire that was sorely missing in the beginning of the season. With a renewed sense of vigor after the past two weeks and two hard-fought victories, the Cats have started anew.